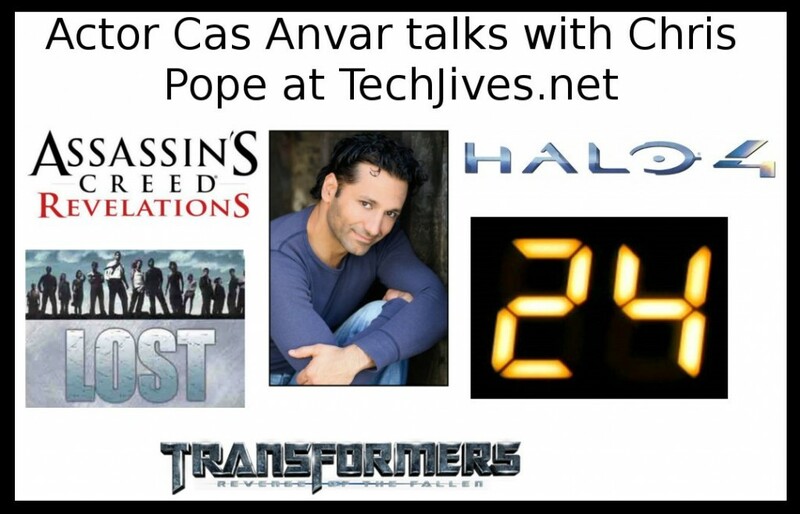 Chris Pope talks with actor Cas Anvar on this episode! Cas Anvar was born in, Canada, raised in Quebec and graduated from Montreal’s prestigious National Theatre School (Canada’s Juilliard). This versatile and exciting actor has performed in over 60 major roles in both film and television. Most recently Cas is shooting on location in Croatia playing the world renowned boyfriend of Princess Diana Dodi Fayed opposite Naomi Watts in the highly anticipated Lady Diana film Diana formerly known as Caught in Flight. Cas has been enjoying fame in the VIDEO GAMING and voice circuit as the voice of ALTAIR in Assassin’s Creed: Revelations as well as substantial roles in several of the largest games in the world. He will be doing Altair Game signings in Nottingham for the release of AC3 on October 31, 2012. His European Debut came with his role of Kamel in AIR FORCE ONE IS DOWN, a 4-hour Mini series shot in Luxembourg, slated to air in the next 6 months, where Cas was delighted to play something a little outside his normal casting as the US Air force Sgt responsible for tracking down the president’s plane after a highjacking. He was thrilled to be starring with Rhys Ivans, Anna Friel, Bob Hoskins and Charles Dance in the SYFY event NEVERLAND. This epic fantasy adventure playing the swashbuckling, hilariously nasty pirate foil to Hook was one of the highlights of his career. Earlier this year he was working opposite Ben Affleck in the historical action thriller ARGO and recently was seen on USA network as the Guest lead on IN PLAIN SIGHT and on TNT in an episode of LEVERAGE. Cas was had a blast to punching it out with Jake Gyllenhaal in the Duncan Jones’ SciFi adventure SOURCE CODE. Cas has also been seen in the suspense thriller THE FACTORY opposite John Cusak in early 2012. Cas appeared opposite Naveen Andrews in the final season of LOST playing Sayid’s brother. As well as being in the SYFY mini series THE PHANTOM playing the psychotic and nefarious Raahtib Singh for which he was nominated for an ACTRA AWARD for outstanding performance by a male lead. Previously he appeared opposite William Shatner, James Spader and Candice Bergen in the hit series BOSTON LEGAL and opposite fellow Canadian Keifer Sutherland, on 24. He was delighted to work opposite Mark Harmon on the hit CBS show N.C.I.S., in David Mamet’s CBS action series The Unit, and guest starring in the exciting NBC series E-Ring opposite Benjamin Bratt and MEDIUM opposite Patricia Arquette. Anvar also starred in lead roles for the WB feature film SUBLIME and the BBC/Discovery miniseries SUPERSTORM for which he earned a prestigious ACTRA nomination for BEST ACTOR. And was honored to work opposite Christopher Plummer in the acclaimed film AGENT OF INFLUENCE. Canadian audiences may recognize Cas as the arrogant Dr Singh from the CBC’s critically acclaimed mock-u-mentary series about obsessive hockey parents who live vicariously through their kids, THE TOURNAMENT ( for which he was nominated for 2 GEMINI awards for BEST ENSSEMBLE CAST). Anvar first came to popular attention In the Cruise/Wagner film SHATTERED GLASS, Anvar portrayed Kambiz Foroohar, a moral force who unmasks the fraudulent reporter Stephen Glass, played by Hayden Christensen. Widely acclaimed on the festival circuit, SHATTERED GLASS premiered at the prestigious Telluride Film Festival, followed by the Toronto International Film Festival, with a general public opening in New York. The film was nominated for 4 Spirit Awards and 1 Golden Globe. His extensive list of credits include Steven Spielberg’s THE TERMINAL opposite Tom Hanks, Catherine Zeta Jones and Stanley Tucci. An accomplished stage actor, Anvar has played countless leading roles in Shakespeare’s most famous plays. He has also directed many of the Bard’s works. Anvar respected as the Founding Artistic Director for over 18 years of the acclaimed Shakespeare-in-the-Park touring company, Repercussion Theatre. The only touring Shakespeare In The Park troupe in the world. With innovative, visually dynamic, totally accessible productions and a truly impressive ability to mount, perform and dismantle a Shakespearean play in a day, the company tours extensively across eastern Canada and all through the U.S. as far south as Texas. The fluently trilingual (English, French and Farci) Anvar, who credits part of his wide-ranging creativity to his exotic cultural and spiritual heritage, is a recipient of the Carla Napier Award for Achievement in the Montréal Theatre community as well as Alliance Quebec’s Youth Achievement Award for accomplishments in the Arts. Also an emerging film and television director and producer, Anvar is currently actively developing several film and TV projects including a teen action/fantasy series which has been optioned by RHI. He spends his time between Canada and L.A.